From the dense jungle floors of Sumatra, the snow-capped peaks of Nepal, the mysterious temples of Cambodia, serene rice terraces of the Philippines, the stifling streets of Mumbai, across the sunburn grasses of Mongolia, down the mighty Mekong, back up to the colourful villages of Thailand’s Hill Tribes, and every jaw-dropping landscape and mind-bending metropolis in between, Asia is a complicated mosaic of limitless travel possibilities. There are few places on Earth where the modern collides so intensely with the ancient. This continent offers up an impressive cast of characters and villains of whom have graced the pages of history, contributed some of the most dramatic advancements in modern technology, offered up culinary treasures that have spawned entire world food movements and has suffered some of the most catastrophic events in human history – And it is these extremes that bring travelers in droves. Asia is home to over 4 billion people, which translates into 60% of the world’s population. Further, at 87 people per square kilometre, it’s also the world’s most densely populated continent. Even though China is the world’s third largest country, it only has one time zone! Despite it’s highly classist system, India is home to the world’s largest democracy, at 1.2 billion people. 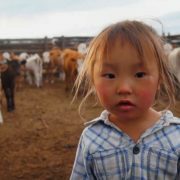 Some 30 to 40% of Mongolians still live a nomadic way of life. They spend the year raising and moving livestock to exploit resources for survival. Despite living in exile since 1959, today’s Dalai Lama is still the political and spiritual leader of Tibet and contrary the ability to travel through this region, Tibet is still not free. Kazakhstan may be the world’s largest country in area, however, it’s has one of the lowest population densities at only 6 people per square mile! Indonesia is home to the world’s largest volcanic lake – Lake Toba’s last eruption occurred some 70,000 years ago and was the largest known explosive eruption on Earth in the last 25 million years. If you have your heart set on Cambodia, this is the best month to visit. Temperatures hover somewhere around 25°C, there is very little rain if any, and skies are blue. If Laos is on your bucketlist, the end of January and into the whole month of February, the weather is fantastic this time of year. There’s whale watching, and then there’s Blue Whale watching – If you want a chance to see these gentle giants in the wild, Sri Lanka is the best place to do this and March is the best time of year. The end of March & early April marks the end of Southeast Asia’s dry season, and while the weather can still be fabulous, temperatures can climb to 40°C with humidity that can make travel uncomfortable. China can feel unbearably humid during the summer months, but the spring brings lighter domestic crowds, moderate pricing and less line-ups for major tourist sites. September and October are also excellent months for visiting China, especially the larger cities like Hong Kong, Beijing and Shanghai. If you have designs on visiting Indonesia, especially Bali, you couldn’t dream up better weather. Temperatures are comfortable, winds constant and skies crystal clear. Unfortunately, Bali becomes crammed with Australian and European tourists and it can make pricing quite high. Sumatra, Java and Sulawesi are less crowded (and less traveled), so consider spending most of your time exploring off-the-beaten path locales. While these are fantastic months to visit China, during ‘Golden Week’ (29th September to 10th October), the entire country is on holiday. Trust me, you don’t want to attempt a holiday when 1.4 billion people are on the roads, in the skies and on board every train in the country, all at once! This window of time is India’s high season – In the southern part of the region, the days are pleasant and warm, and the nights are cool. In December and January, the northern parts of the region see warm days, and chilly nights, with temperatures climbing steadily from February onwards. For those wanting to explore the Himalayan region, mountain passes to Ladakh and higher elevations open from July and remain accessible into September, a time when the monsoon rains arrive. Southern regions like Kerala see heavy rains from October into early December. April – June is the low season for much of India – May and June are swelteringly hot, and the June monsoon rains bringing stifling humidity. It may the best time of year to travel if you’re on the strictest of budgets, but not always the most comfortable if you’re moving around. The Taj Mahal has been drawing crowds for more than 360 years, and this World Unesco Heritage Site is set to close in the coming years for restoration. Converse with a holy monkey at Swayambhunath Stupa, a fifth century temple complex overlooking the jaw-dropping Kathmandu Valley. A small monastery is located at the top, and if you travel with a guide (recommended), ask your guide to light five candles in the monastery for good fortune. There may be steep price to visiting the unique nation of Bhutan, but the $USD250 per day is a means to protect this small mountainous nation from potential damage gap-year students and backpackers have created other places in Asia (Goa, Thailand, Vietnam etc). Pay homage to “The Lady” in Mayanmar’s bustling capital of Rangoon. There are plenty of buildings throughout the capital selling posters and trinkets bearing the image of famous human rights activities Aung Suu Kyi (who is now a member of Parliament). If you’re going to visit Vietnam, sailing around Halong Bay is an absolute must. The 580-square-mile natural cove is home to more than 2,000 limestones, inhabited only by flora and fauna. Built in the late twelfth century, the lost city of Ankor Wat is no doubt one of the most prominent archaeological sites in Southeast Asia. The crowds can be unforgiving during the day, but if you can swing it, visit the temple just before sunrise, it’s a truly unearthly experience. Singapore may be known for its pristine cleanliness and gleaming modernity, but it’s also an incredible culinary hub. Whether you have a quick stopover or long stay, head to Airport Road Food Centre and fill up on the best Hainanese Chicken Rice and singapore chile crab you’ve ever head. You’ll be hard pressed to find peace and serenity in Bali’s boisterous Kuta and Legian regions – Instead, head inland to Sidemen Valley, a breathtaking valley brimming with lush rice terraces, spectacular views of Mt. Agung and a snapshot into Bali’s beautiful rural life. It’s hard to choose one, two three or one-hundred things to do in China, it’s so diverse and vast. But if you can squeeze in a visit to the Great Wall, a stop in to see Qin Shi Huang’s Terra Cotta Warriors in Xian, a quick visit with the Pandas in Chengdu and some time in a southern mountainous city like Lijiang, you may do this culturally fascinating country some justice.